One night over break, Yang and I were furiously chatting each other about what to make the next day. She said raspberry cupcakes, and I countered with lemon raspberry cupcakes. I thought of these lemon raspberry cupcakes from Bon Appetit that I wanted to make six plus years ago. And then we were set. I didn’t sift the powdered sugar; you really don’t need to, since it combines with everything else. I zested two lemons and didn’t worry about exact measurements. I didn’t have any self-rising flour, so I made my own according to this formula from King Arthur Flour: 1 cup flour, 1 1/2 tsp baking powder, 1/4 tsp salt. The amounts of the latter two I needed were weird (7/8 tsp baking powder and 5/16 tsp salt), so I eyeballed them. For the buttermilk, I did the vinegar and milk sub that I love/use so much. Yang accidentally added both additions of the dry ingredients before the wet, and I teased her for not paying attention to the directions. And then I added 4 T lemon juice, when there was only supposed to be 2 T in the batter, so we were even and she got to smack me. I found that it works best to have more batter in the bottom than in the top. The jam sinks down, so it ends up near the equator if there’s more batter to go through. They baked exactly for 23 minutes, and were springy with minimal crumbs attached to the used toothpick. We were too lazy to zest another lemon for the icing, so we didn’t. The icing was super thick, so I added more lemon juice to thin it out. The icing wasn’t very yellow, so we added jam to all of the icing and made it pink; the jam we had was kind of watery though, and made the icing a lot thinner than I was expecting, transforming the icing into more of a glaze. We only used a bit at a time for each cupcake, and then went back for a second coat once the first layer had hardened somewhat. Yang really wanted to decorate, so I got out some dark chocolate. She melted it down, plopped it in a ziptop bag, snipped a hole, and piped designs on a sheet of wax paper. She made bows, hearts, flowers, stars and zigzag whatevers, thanks to the inspiration gleaned from some person’s Instagrammed cupcakes decorated similarly. We placed them in the fridge to set before arranging them on the cupcakes. My first Instagram post was comprised of these lemon raspberry cupcakes. I got a new phone for Christmas, and these cupcakes were pretty and yummy enough to spread out into the world. Yang tutored me on different apps and how I could make a collage with them and add different filters/colors, but there were just so many choices. Eventually I was like THIS IS TOO STRESSFUL and clicked the post button before I could mangle it some more. 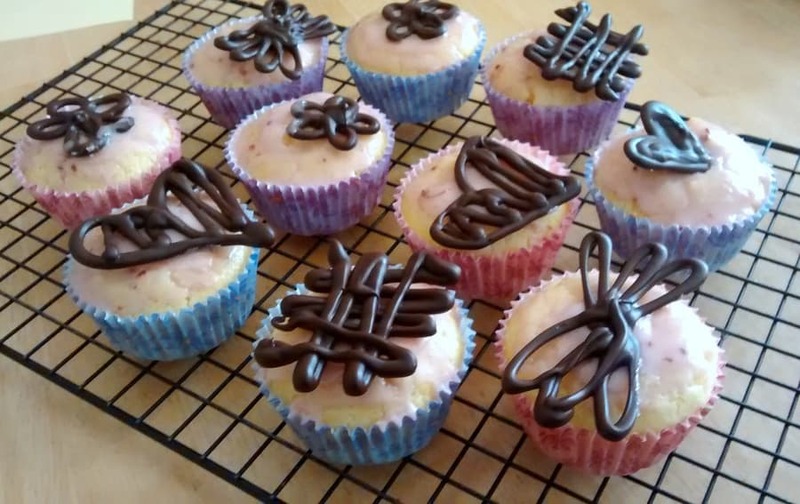 The icing was too sweet on its own and not particularly lemony or raspberry-tasting, but it helped create a barrier for the cupcakes and kept them moist. The real star was the cake. It was a bit dense I thought, but had such a lovely lemon flavor. The raspberry went really well with it (of course). The tartness of the citrus and berries helped the cake from being too cloying. I didn’t try the cupcake with the chocolate (I ate the chocolate first), but others enjoyed it. So much so that they took a bite of Molly Wizenberg’s famous lemon yogurt cake (which I made the day after these pretty things) before promptly devouring the rest of the cupcakes. I may have been 6.5 years late making these, but I’m glad I got around to them. Beat butter, 1 1/2 cups powdered sugar, and zest in a large bowl until fluffy and pale yellow. Add the eggs one at a time. Beat in half of the dry ingredients. Add the buttermilk and 1/4 cup lemon juice; beat to blend. Beat in the remaining dry ingredients. Drop 1 rounded T batter into 12 muffin liners. Spoon 1 tsp jam over. Add enough batter to cover the jam. Bake at 350F until tester comes out clean, about 23 minutes. Cool in pan. Meanwhile, whisk 1 1/2 cups powdered sugar, 3 T lemon juice and 1 T jam. Spoon over cupcakes. Let stand until icing sets, about 30 minutes. thanks makos! i love how these aren’t so sweet and feel a bit lighter than, say, chocolate cake.